Hello and welcome to summer at Thimblestitch! 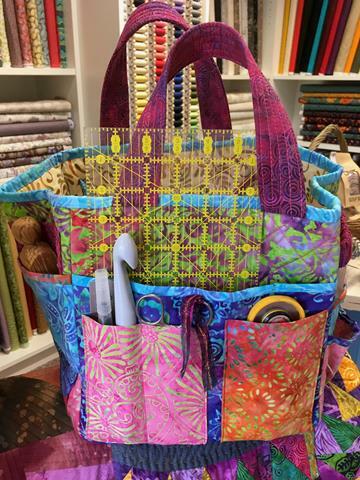 We have some irresistible new collections in and great workshops lined up for you. This is a superlong newsletter to catch up so grab a cuppa, put your feet up and relax. Before we get to the good stuff we need to have a little grumble. We really need you to pay deposits and your balance before a class or set of classes (e.g. Six weeks of dressmaking) or we won’t be able to provide as many lovely workshops. Have a look at our new Terms and Conditions www.thimblestitch-devon.co.uk and look at the small print. There is important info about your commitment and ours. Like every business that provides classes we still have to pay the tutor and their expenses even if you don’t turn up and we can’t afford to run at a loss. Our very reasonable fees are calculated according to the number of places. Due to tutors’ commitments we have to make decisions as to whether a class is viable quite a long time in advance. Recently we had to cancel the amazing Annette Emms as we had lots of interest but too few deposits. She was such good fun last year too! This is what we could have done with her ! Grumble over! Let’s celebrate what we have done already. 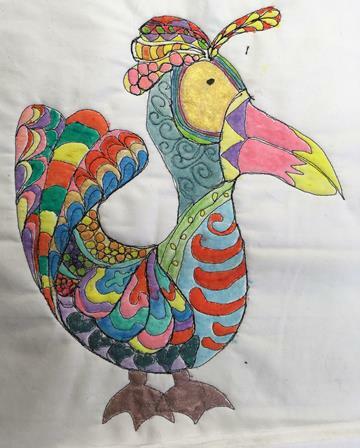 A Doodle Bird Day with Claire Passmore. Linda Miller 3D on dissolvable. 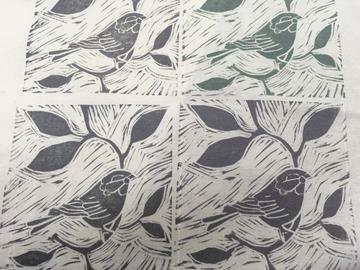 Louise Nichol’s brillant class Lino Cutting and Printing. Still places on her Embellished Cushion ! We learnt so many new techniques from this lovely and very professional tutor. 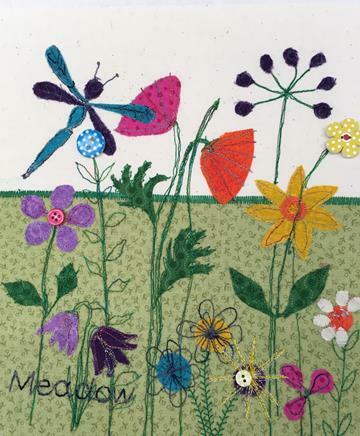 Karen Fanzo’s Summer Meadow; popular as always! 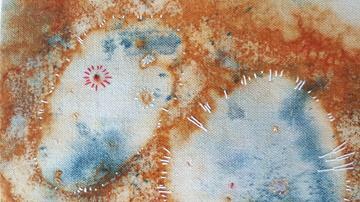 Dee Priest’s Stencil and stitch had some lovely results. 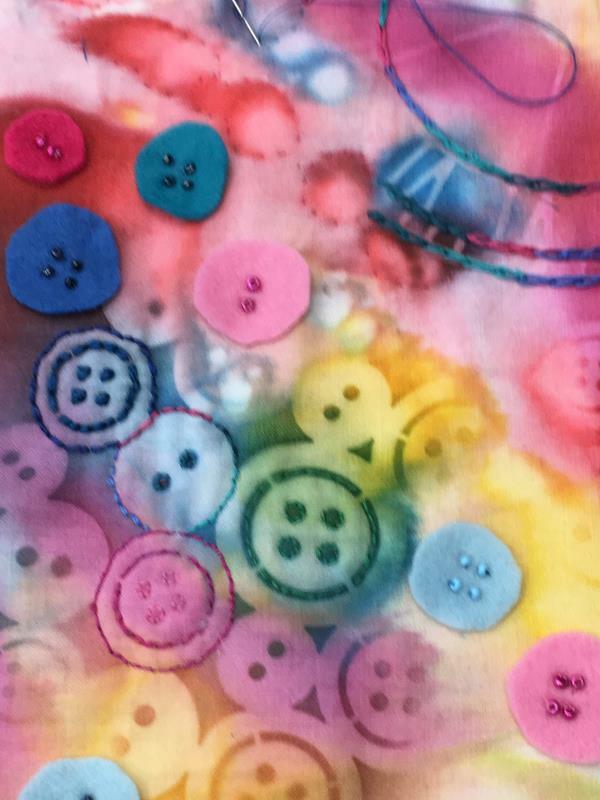 More wonderful workshops with new tutors have already been booked for autumn and winter. 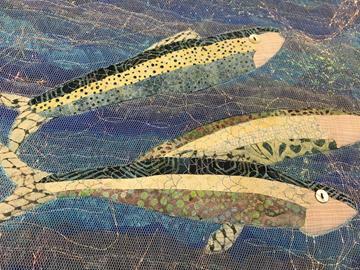 Keep your eyes peeled and keep checking the website www.thimblestitch-devon.co.uk We don’t want to cancel so please commit. 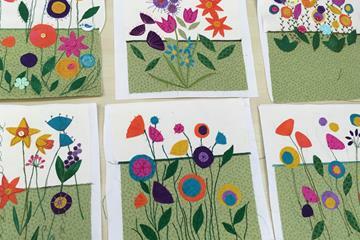 The two day Print to Stitch with Gillian Travis is Full, you can put your name on the waiting list if you fancy. You might be lucky ! 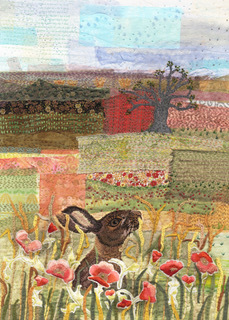 There is a space on her interlocking Patchwork 13th June. 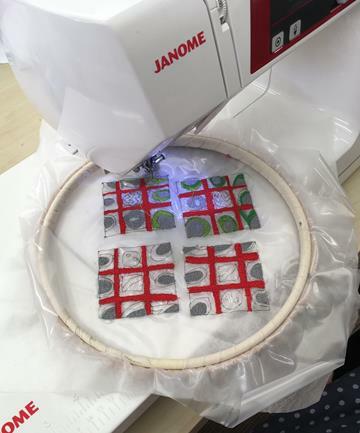 Using an innovative method of weaving or interlacing. 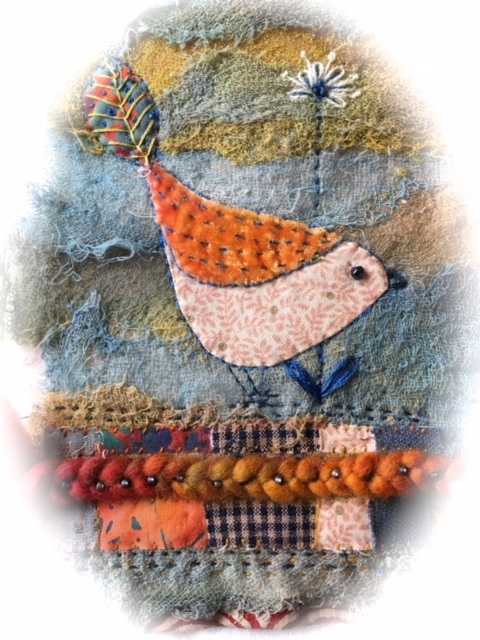 Sat 16th; Louise Nicholls: Embellished cushion Spaces Left ! We are again hosting an exhibition by The Woodmanton Group. 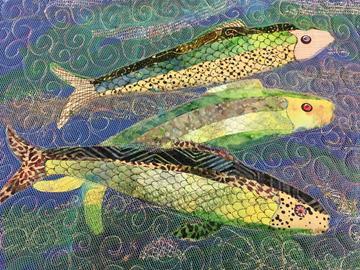 This is a local group of textile artists led by Gwen Hartley. Last year they had a hugely successful exhibition here with completed work, some sketchbooks and mini demonstrations. After reading all your lovely comments they have decided to show mainly planning, methods of developing a theme, samples and sketchbooks as well as a resolved piece of work. The title is Inside Out and it will be running in August on Sat 4th, Tues 7th, Wed 8th, Thurs 9th, Fri 10th and Sat 11th from 10 until 3.30. Do come along and see what they have been up to. It’s rare to have access to all the processes! September is buzzing with lots of new classes, so do book early. Some sad news Katie Haywood is leaving us. She has found her time is in short supply with her family and business commitments, so we all wish her well. On a positive note Vanessa Borrell has stepped in to fill the breach on Wednesday nights more details on the website but classes start on the 5th Sept 7-9pm. Sat 1st: Fun with free motion with Linda Campbell. Suitable for those with some experience of FMQ. 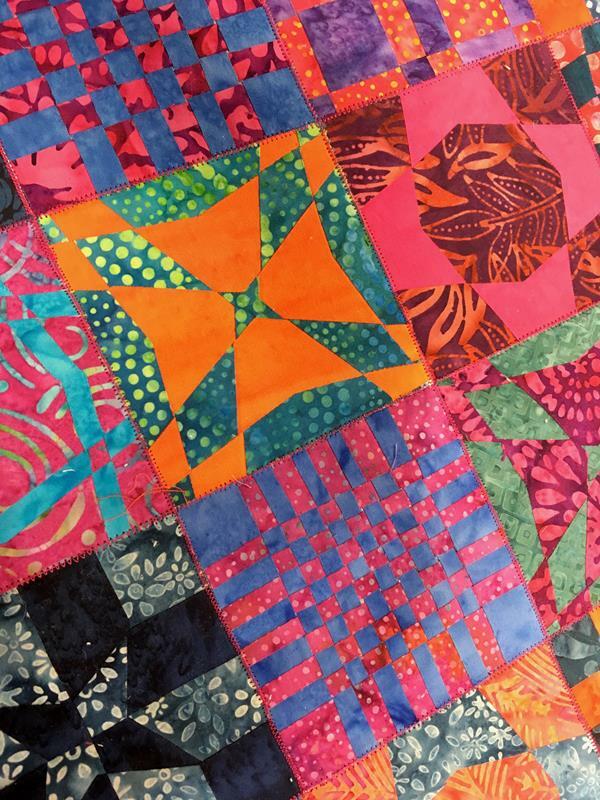 We have also added 3 more dates for linda’s Free motion and Walking Foot Quilting. 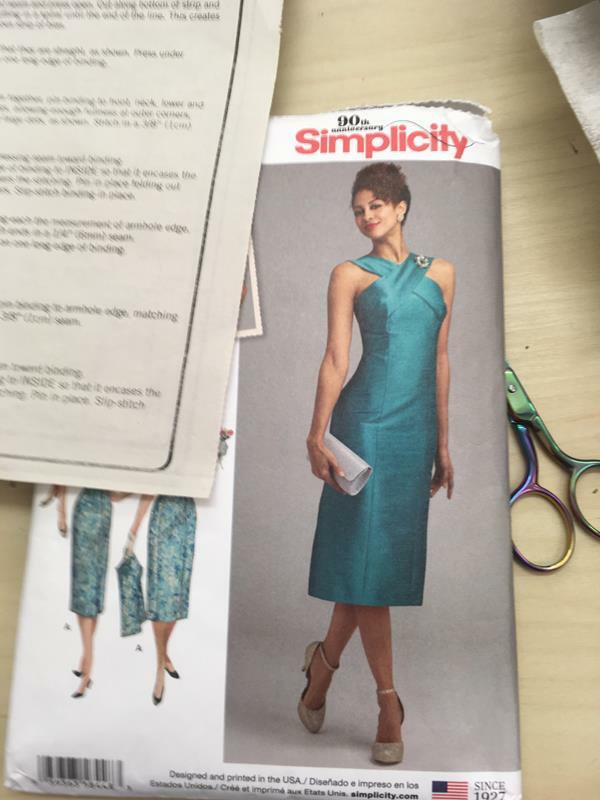 Starting Thurs 6th: A six week course in dressmaking with Karen Fanzo. One group in the afternoon and a different group in the evening. Sign up and pay for these speedily as they get full very quickly! Sat 15th: Reversible skirt with Katie Haywood. Make this very versatile Skirt, great for Holidays, two skirts in one !! 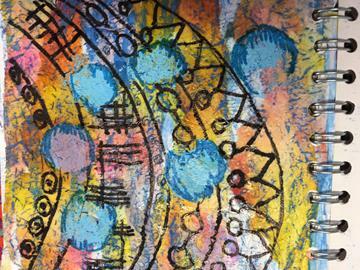 Fri 21st: Sketchbooks: Pattern and Shape with Dee Priest. End up with a book of inspiration. Sat 22nd: Rust and Woad with Adele Thomas. A fabulous new tutor to Thimblestitch ! We are going to such fun on Dee’s Day No Drawing !! 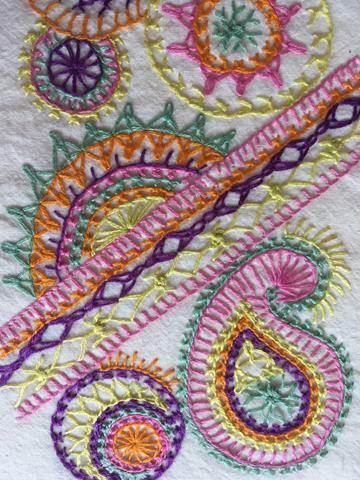 Have a play with different techniques, and then stitch as well ! 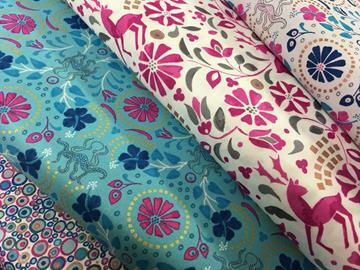 Look at the two new delicious collections from lewis and Irene that have just come in to tempt you! Get them to stroke before the autumn! 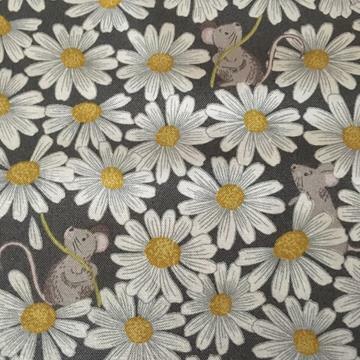 Also in for the new craze Sashiko we now have the threads and needles needed and I can order the templates. Last but not least, you generous people have funded a new toilet this time in South Sudan. That is an amazing 7 toilets in parts of the world in direst need of the most basic sanitation and dignity. Thank you so much. Join my FB page to get the really up to date news. There will be a small prize for number 600! That’s all for now …..
You’re receiving this because you have expressed an interest in Thimblestitch @ Zoës shop, workshop and classes. Monday: Closed Tuesday: 9:00 - 4:00 Wednesday: 9:00 - 4:00 Thursday: 9:00 - 4:00 Friday: 9:00 - 4:00 Saturday: 9:00 - 4:00 Sunday: 10:00 - 4:00* *please phone to check Sunday opening times.